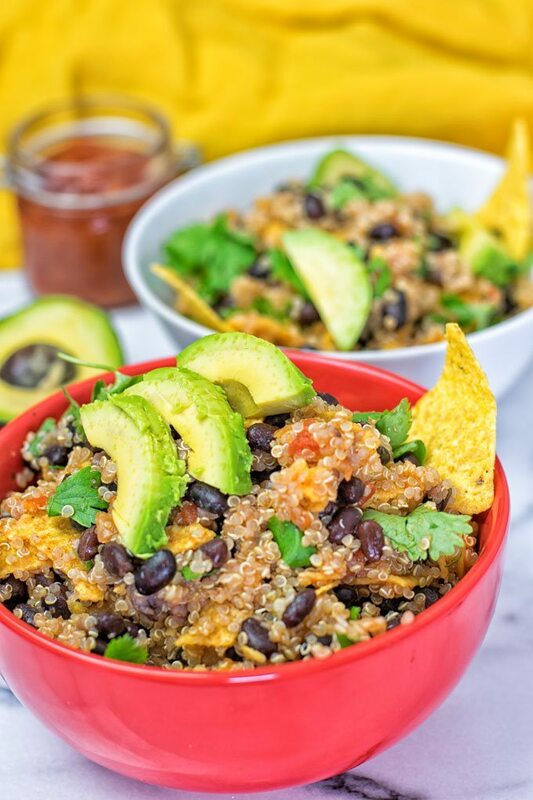 Enjoy this vegan Quinoa Taco Salad made with just 5 ingredients in 2 easy steps. 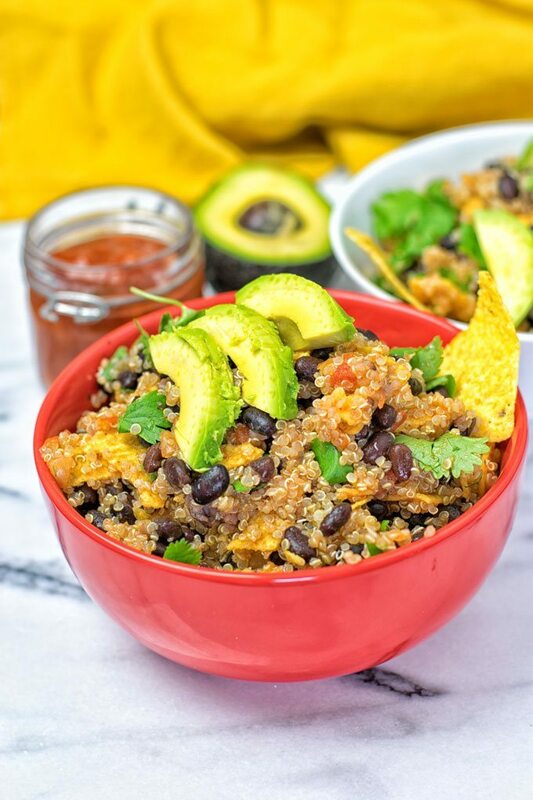 A plant-based, gluten free, Mexican delight with quinoa, salsa, black beans, and avocado. It’s so hot here in the Netherlands. I can wear shorts and t-shirt, real summer vibes. In such times I’m craving a bit lighter meals, what about you? What are you craving when it’s getting hot? By now you surely guess that I’m going for an addition to my Salad Recipes. 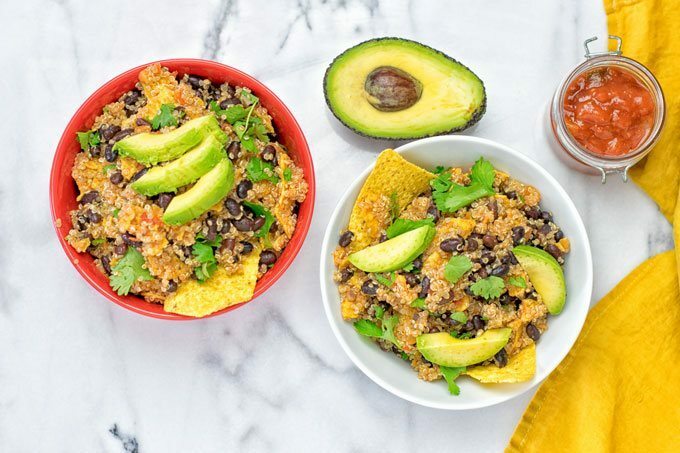 Are you ready for this new Quinoa Taco Salad? What better to enjoy than something fresh and healthy. Full of flavors that scream summer! I somehow associate amazing Mexican flavors with this time of the year. Probably because I enjoyed a lot of Mexican inspired food in some of the greatest summers I can remember. So there is a fondness that is filling my memories. 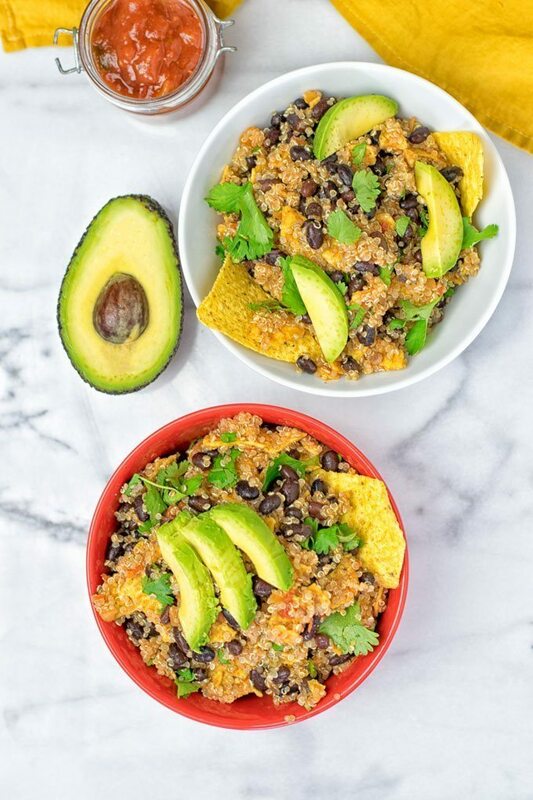 Beans, fresh cilantro, avocado, crunchy nachos – they all come together in this fantastic recipe. Let’s waste no time and let me show you how to make this. Start with cooking the quinoa according the manufacturer’s directions. While the quinoa is cooking, drain the black beans and transfer to a big bowl. Later, add cooked quinoa, salsa, tortilla chips, and season with salt and pepper. Garnish with avocado and the optional coriander, and you are ready to enjoy this salad. 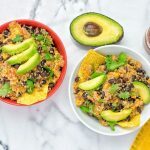 I’m sure you will all love this Quinoa Taco Salad as a new member of my exciting Mexican recipes. It’s flavorful, easy, done in no time, so delicious and versatile. There was a get together recently at one of my friends and I was bringing this salad for good use. It’s is definitely a time saver if you plan to bring something to potlucks as well. You can make this in no time, friends and it’s of course so portable, this will also make the perfect lunch for work. Think about main course on it’s own, side dish, this will make a delicious addition to grilled tofu, tempeh, or just veggies. The flavors work so well together, so say hello to grilling season! One word to the tortilla chips and salsa: You can make your own tortilla chips and salsa easily no big game, but if you’re a lazy kid, no worries. Just make sure you always buy organic whenever it’s possible. I bought my Salsa and Tortilla chips at a organic store with really clean and few ingredients. Both are vegan and gluten free. Some Salsas and tortilla chips may not be vegan so please have a eye on this! Besides all the overflowing yummy-ness of my salad, as always, it’s packed with a load oh healthy nutrients too. I love using black beans in my recipes a lot. Black beans are a good source of protein, are full of antioxidants and vitamins – all of that at a really affordable price. Nothing fancy, just good food! Read up on more info about “Black Beans Nutrition, Health Benefits & Recipes“. Friends, grab a bowl and make this Quinoa Taco Salad. I’m happy to hear your feedback, give me a tag, take a snap on Facebook or Instagram as always. Cook the quinoa according the manufacturer’s directions. While the quinoa is cooking, drain the black beans and transfer to a big bowl. 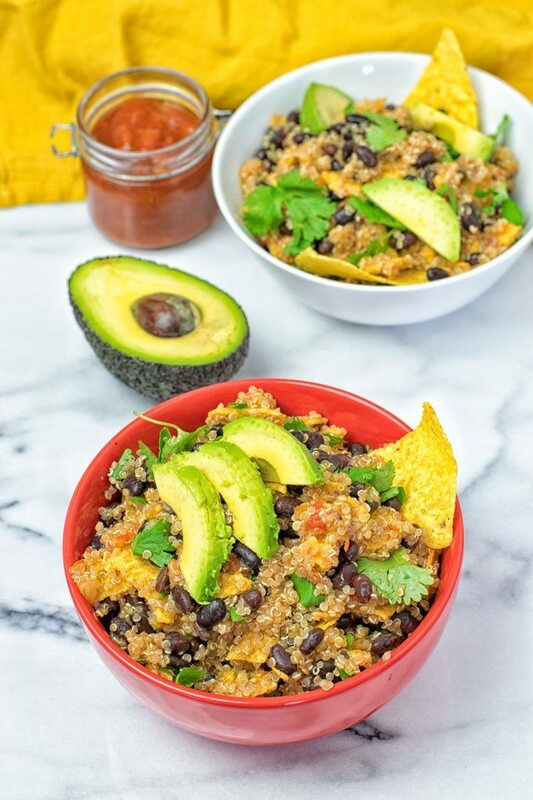 Add cooked and cooled quinoa, salsa, tortilla chips to the black beans. Season with salt and pepper and garnish with avocado and the optional coriander. Haven’t had quinoa for awhile and after seeing this I’ve been missing so much! Love the flavors and textures here! This is a bowl I can devour. This looks sooo good Florian! I love, love Mexican food which I think you know by now, haha. I had it for dinner tonight in fact. 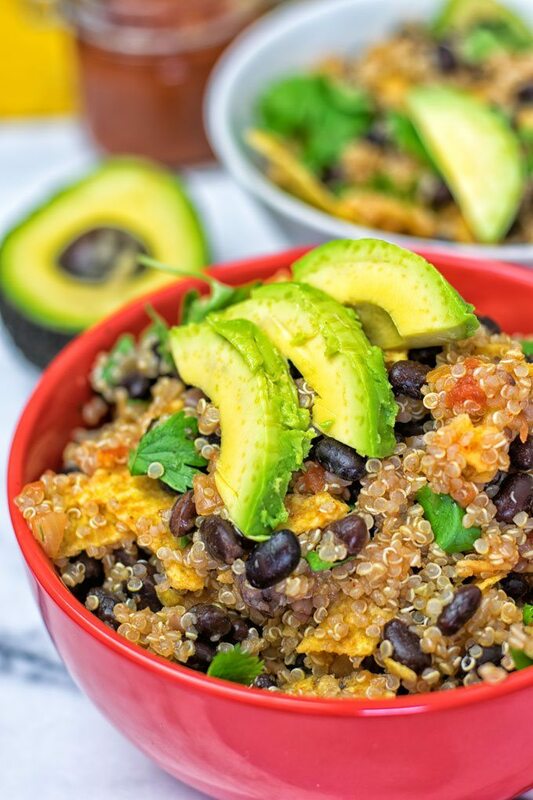 I love that you paired these flavors with quinoa, what a lovely twist from regular rice. Mexican food is pretty much weekly around here. I could eat a gigantic bowl of all this! It looks fantastic and I love all the colors in your photos! Hi Brenna! Thanks so much for your amazing feedback! Glad it was such a big hit! Just found this recipe and I’m so excited to make it for my lunch meal prep next week! Thanks for sharing this! You’re so welcome, Amanda! Let me know what you think! Thanks so much for your fantastic feedback, Dawn! One of my favorites!